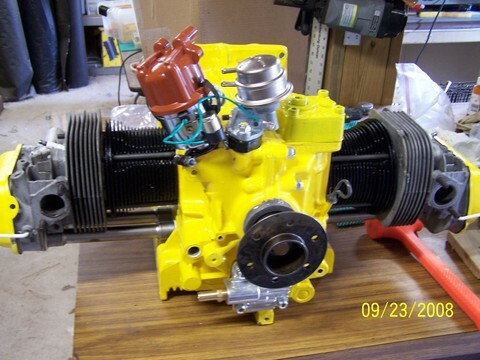 Looking for a way to mount a 4-stroke engine to your ultralight or light aircraft? The economic solution is to take a full-case Volkswagon engine and modify it from four cylinders to using only the front two! There are various plans available from different sources for converting a full VW engine to a 1/2 VW engine, but they all, including our plans, specify removing the rear 2 cylinders, cutting the crankshaft and cam, and cutting the cylinder heads. There are then a multitude of various other modifications needed to seal up new openings created during the conversion and keep the engine leak free. These plans were originally drawn by Scott Land in 1995 and were only 7 pages long. The rights were purchased by Simplex Aeroplanes in February 2011 and have been revised with extensive information added. The new plans include 14 pages of written instructions with additional pages of figures and drawings. There are even full scale templates for making the proper parts.The detailed plans and drawings which take you all the way through the conversion process to actually starting and running your creation. The plans come spiral bound in an easy to understand format. Keep in mind that our plans call for using the entire case as this is the easier method and in many ways the preferred method for conversion. They do NOT specify how to do the cut-case type conversation. Parts are low cost and available via the internet or sometimes can be purchased in your home town. The engine is relatively lightweight. There is no expensive or heavy reduction drive or exhaust system to mount. Most of the time the crankcase is made of magnesium which is 33% lighter than comparable aluminum. If you build it well your engine will weigh 85-90 lbs. Engine HP can be from 28-37 hp depending on the internal parts used. The cylinders are aircooled, though truth be told most of the cooling comes from the oil. This means you don’t have to worry about a heavy or complex liquid cooling system. Here Jim Pfarr does an excellent job of showing how to do the static timing for the 1/2 VW engine.